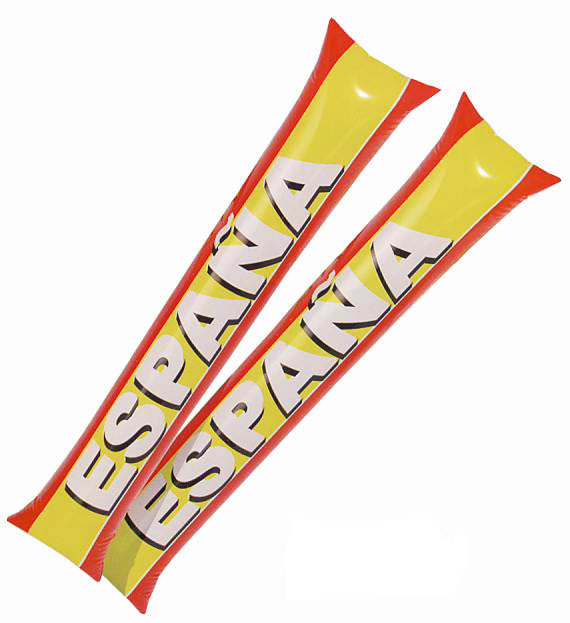 These Spanish flags are made of plastic and have a lot of uses, like sports demonstrations as the football WorldCup in Germany, decoration for tables, welcoming important people, a neverending of uses that express joy.They are sold by 25 units.Stick: 40 cm.Flag: 30 cm (large) X 20 cm (high) Change not admited. We present you these flags of the spanish flag for the table.There is a black plastic pedestal. These small flags for table with flagstaff of 27cm high and a base of 3.5cm.The spanish flag measures 15 x 10.5cm. Spanish flag Garland made of paper. As they are made of paper, they are not suitable for the outdoors. Measures of each flag 15 x 20cms. 2 garlands of 25mts Very nice for decoration, social and sports events, associations, administrative and commercial centres, hotels etc. This article does not admit change. Spain has been a champion in almost all sports. We are good in football, tennis, motorbike, formula 1. If you want to spport and give colour, wear this scarf with the Spanish flag. Measures: 125cm X 14cm.